IN THE Financial Times series ‘Capitalism in Crisis’, there were articles by leading politicians, regulators, financially-driven CEOs, philanthropists, economists, and even by ‘Occupy London’. But not a word from marketers. Failures in financial regulation, the flawed structure of banking, excessive risk-taking, conflicts of interest, toxic cultures, weak auditing, and the role of governments were all examined intelligently. But scarcely a word about customers or the circumstances which will empower them in future. Past models of capitalism were dissected and future ones discussed. Many excellent points were made. Yet the most obvious one – that only customers can make capitalism work better – was not. Customers are the essential lubricant for making capitalism work efficiently. If they are informed, protected and empowered, they will engender and sustain a competitive environment where innovation flourishes, and organisations providing the best value will win. Marketers view businesses through the prism of segments, brands and customers, rather than short-term financial ratios. The future of capitalism, and the development of a more effective version centred on customer empowerment, depends heavily on the vision and capability of marketers. The root cause of recent financial crises is lack of customer focus by banks, regulators and governments. Over-borrowing, sub-prime lending, excessive leverage and securitisation are merely symptoms of this larger malady. When the customer becomes invisible to product/service providers and regulators, trouble always follows. Sub-prime lending in the US is a case in point. Banks made loans, often to people with low incomes, and charged high interest. The loans were secured against homes which were often overvalued. These were then consolidated and treated like a block of frozen fish, cut into fish fingers. They were sliced and diced into fancy financial packages, rated AAA by credit agencies, then sold on by the banks to third parties. By then, no-one knew what these packages contained (at least with fish fingers you know whether they are cod or pollock). The link between borrower (customer) and lender was broken. The customers, unknowingly, were spread so thinly that they had become an invisible ingredient. In his book The Big Short, Michael Lewis instances a Mexican strawberry picker living in California, who spoke no English and had an annual income of $14,000. He was lent every penny he needed to buy a house for $724,000. Most marketers genuinely care about their customers. Those constructing and selling sub-prime mortgages appeared not to. The lesson is that, until banks put the customer at the centre of their business model, bigger and bigger financial crises will recur. How have we got to this stage? After all, marketing has been around since the 1930s in the US and the 1950s in the UK. The Consumer Association (Which? magazine) was established in 1957, the Office of Fair Trading in 1973. In recent decades, regulators have made a positive difference to customers globally. Yet the world is still full of companies and whole business sectors that gouge, mislead and rip off customers – profitably. Progress is being made in improving customers’ lives on many fronts, but it is slow and patchy. According to the Michigan Business School Customer Satisfaction Index, levels of American customer satisfaction have not improved in the past 20 years. So which are the sectors and companies that extract, rather than add value to customers? And what can marketers, customers, regulators and consumer advocates do to change their culture? Companies with these characteristics can be termed ‘value extractors’, in contrast to those the Marketing Society would champion – ‘value adders’. Value extractors are not a rare species. Many fine specimens flourish. Capitalism works much better in some markets than in others. It is most effective in sectors with high frequency of purchase, low switching cost, straightforward products and clear pricing. These conditions enable customers to exert leverage, develop good knowledge of alternatives and switch when they find better value. Companies in these categories are mostly value adders, and include Colgate- Palmolive, John Lewis Group, FedEx and Google. Their organisations are built around meeting customer needs better, not because they love their customers, but because this is their best route to long-term profitability. They don’t extract profits through hidden charges. They earn them by making people’s lives better. The originators of modern marketing – Procter & Gamble and General Foods in the US, and Unilever, Rowntree and Mars in the UK – marketed products. And, to date, capitalism, like marketing, has worked better in products than in services. But in most western countries, service providers account for over 70% of GNP. While certain service providers, like Amazon, UPS, IBM and Skype, have dramatically improved customers’ lives, many remain value extractors. They have selectively exploited the techniques of marketing, but never embraced its basic philosophy and values. While, in most markets, there is a mixture of value adders and value extractors, one or the other usually predominates. Figure 1 (above right) shows some examples. Some may be surprised to see ‘City professionals’ in the right hand column. While provincial professionals do much socially useful work for individuals and SMEs, many City firms have lost their professional ethos and become machines to maximise billable hours. City lawyers are responsible for crafting many of the contracts that disadvantage customers. The City professionals sector could be described as ‘assistant value extractors’. To better understand value adders and value extractors, let’s examine the concept of the surplus. Companies generate a financial surplus, after meeting their customers’ needs, paying employees’ salaries, and funding necessary expenses including marketing. The surplus will then be divided among shareholders/ owners (dividends, share buybacks), employees (extra rewards), and customers (extra investment). These decisions are usually made unconsciously or informally, but they always have to be made. The results do not appear in financial accounts. Value adders generally get this balance right. They think long-term and give priority to continuously improving the customer experience. That’s how they generate long-term profits. Practitioners like DuPont were founded in 1802, Procter & Gamble in 1837, 3M in 1902, and Nestlé in 1905. Getting the correct balance in allocating the surplus requires the right values and culture, and good judgement. Tesco, a notable value adder over the years, has recently got the balance wrong by under-investing in UK customers. Value extractors, by contrast, prioritise short-term profitability and senior executive remuneration, funding this model by debasing the customer experience. Common techniques used are deliberate complexity, tricky pricing, cost-driven customer service, use of small print, predatory sales techniques, and exploitation of customers’ lack of knowledge and time. High switching costs (money and time). The major retail banks practise value extraction. Although their scale should make them low-cost operators, they rarely feature in ‘Best Buys’ for either saving or borrowing. While many frontline employees work hard to serve customers well, their efforts are inhibited by unfriendly processes, underfunded customer service, rates that favour new customers, and mountains of small print. These are mandated by senior managers addicted to short-term profit. Innovate – be both better and different. He concluded that where the principles of ‘real marketing’ are applied, they “seem to work”. But he noted “far too many instances where it has never really been tried”. King’s conclusions, 27 years later, remain valid. This raises a third question. Can the value extractors, who have never really tried marketing, survive in the long term? It is to be hoped that marketers, regulators, consumer groups, governments and consumers, too, will gradually ensure that value extraction becomes an unprofitable activity. Most regulation is focused on industries in which value extractors feature prominently. This is logical. There were 1.8 million customer complaints to banks in the second half of 2011, and one third of enquiries to Citizens’ Advice Bureaux related to debt. Of customers who bought energy products on the doorstep, 90% said they would never do so again, and the energy regulator has accused companies of bamboozling consumers. Impose such heavy penalties on offenders that value extraction becomes unprofitable. This has to be done in a way that prevents bureaucracy. For example, the paperwork associated with opening a new current bank account can discourage switching and reduce competition. Most regulators understand what needs to change. Making it happen is the challenge. A recent report by Consumer Focus, Through Consumers’ Eyes, observes that five million people in the UK lack functional literacy, and 10 million have a long-term illness or disability. These groups in particular need protection. Insist on greater simplicity by providers. The number of energy tariffs has almost doubled in the past three years from 180 to 300. Financial service and energy forms should be dramatically simplified and reduced in length – 74% of people have not read the terms of their energy contracts. The report says: “Regulators sometimes expect consumers to shoulder a heavy burden in making markets work… being a consumer should not be a full time occupation.” Providers attach no value to customers’ time, and have little respect for it. Use technology as a positive force in reducing complexity, enabling objective value comparisons, and publicising consumers’ experiences. Embed the interests of consumers by increasing their power in regulation and policy. To be effective, regulators need effective political support, strong powers, courage and skill in implementation. In theory, shareholders own companies, and act like owners. But during the second part of the last century, this theory became a fiction. In 1963, individuals owned 54% of the stock market, but by 2010 this figure had declined to 11.5%. In the far-off 1960s, the average holding period for a share was eight years. Now it’s less than one year. By contrast, employees stay with companies for six years, customers often far longer. Pension and fund managers now hold the majority of shares in the UK and US. Most focus on short-term performance. Many also have conflicts of interest through multiple relationships with corporate clients. While purporting to represent their own customers – pensioners and individual investors – they appear to have minimal contact with them beyond standard reporting and circulars. Over the years, their record in robustly challenging company boards is unimpressive. Most prefer to operate in the shadows of the City with quiet persuasion. Lord Myners described them as “absentee landlords”. There are some exceptions, such as PIRC and CalPERS, who fight for the rights of their shareholders. And recent challenges to CEOs’ and bankers’ pay, such as Bob Diamond’s ‘diamondplated’ package, may herald a more involved approach. However, in the triumvirate of stakeholders – customers, employees and shareholders – the latter are losing importance. This is partly because gaining and holding customers has become the most important challenge for any company, and partly because the concept of shareholder value has become perverted and discredited (see my article, ‘Shareholder Value: The Enemy of Good Marketing’, in the Q4 2009 edition of Market Leader). While we can expect more activism from shareholders in future, this is unlikely to have much customer focus, and will be helpful, rather than decisive, in making capitalism work better. 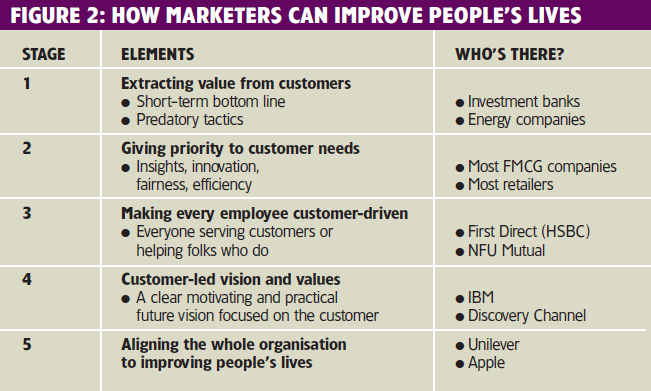 How can marketers improve people’s lives? This is a journey with five stages, starting from extracting value (Figure 2). Stage 1 contains only value extractors; stages 2 to 5 comprise value adders. Moving every company up by just one stage would enhance the future effectiveness of capitalism and improve customers’ lives. Future technology trends favour increases in customer power – better information through the internet, comparison sites, social networking and review sites. This will gain momentum. Customer advocates such as Consumers Union (US) and the Consumer Association (UK) are increasing their impact. Regulators are gaining additional powers, and using them more effectively on behalf of the customer, although sometimes impeded by lack of political support. Some companies are also upgrading corporate social responsibility from a niche ‘add-on’ activity to a mainstream element in their vision for the future. Jim Stengel, the former global CMO at Procter & Gamble, illustrates this convincingly in his revolutionary book: Grow: How ideals power growth and profit at the world’s 50 greatest companies. Simplify things for customers and respect the value of their time. Help change the culture of organisations, so that the voice of the customer is heard in every decision. Marketers spend too much of their time on external communications and not enough on ensuring that the customer’s voice is heard by all their colleagues. Tim Ambler concluded that boards of directors devoted nine times more attention to spending and counting cash flow than to wondering where it came from. Jim Stengel describes how, at P&G, the CEO and senior executives spend a mandatory number of days doing fieldwork and working on the frontline with customers. View regulators and consumer advocates as partners, not opponents. 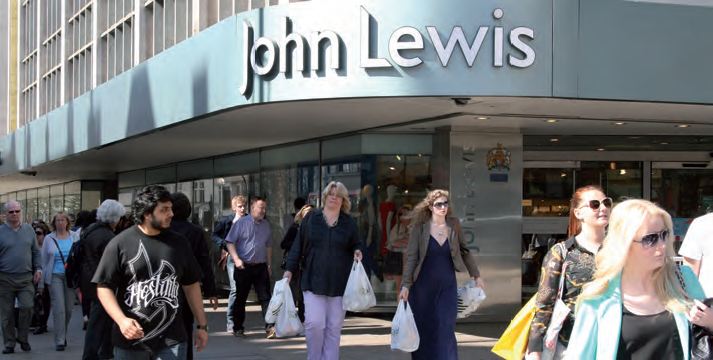 Their objectives are similar to those of marketers – improving the lives of customers. Marketers’ rationale for this is different – they want to earn profits by doing this. But by engaging with regulators and consumer advocates, marketers can achieve common objectives, which are commercially realistic and unbureaucratic. Perhaps the Marketing Society, CIM and IPA should team up with regulators and consumer groups to establish a ‘Hall of Shame’ for value extractors, installing new winners annually at an appropriate event. It is also desirable to have more regulators and consumer advocates with a marketing background. Use marketing skills to change cultures. Marketers and agencies have proved adept at changing behaviour through public service campaigns. Regulators should invest in these skills to change the attitudes of value extractors. Pass legislation requiring every quoted company to have two non-executive customer directors. Make customers partners in innovation via the internet. This is already happening with new product/service development. Help customers by adopting lean marketing, learning from the East. Western customers will probably face flat incomes in the future as the West continues to lose share of trade to increasingly well-educated Easterners. The radical improvements in value which Westerners will need can be achieved by adopting lean marketing approaches from the East. Some global companies are already doing this. Develop bold visions for improving people’s lives through brands (eg Pampers) and companies (eg Apple). There is ample evidence (Jim Stengel’s Grow, Collins & Porras’s Built to Last, Collins’ Good to Great and others) that patient, customer-driven capitalism works best. And that the frenzied short-term, bottom line version, powered by investment bankers and greedy CEOs, does not. Indeed, it fuels bubbles and financial crises that blight the lives of millions. The task ahead is to further empower customers, regulators and customer advocates to make capitalism work better – by making value extraction unprofitable and putting the vision back into business. Businesses need social as well as economic purposes, and should earn, not extract, profits from customers. Many companies are doing this already, but not enough. Marketers are well placed to spearhead the necessary change, in partnership with customers and their advocates. This article featured in Market Leader, July 2012. Hugh Davidson is a former chairman of the Marketing Society and co-founder of Oxford Strategic Marketing.